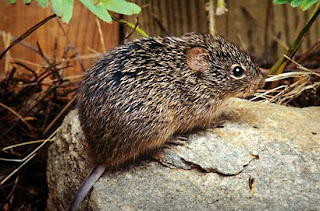 A moderately large, robust rat with pattern of last two lower molars S-shaped; tail shorter than head and body, sparsely haired, the annulations and scales clearly visible; ears relatively small and blackish or grayish; pelage coarse and grizzled, the black guard hairs rather stiff (hispid); hind foot with six plantar tubercles and with three middle toes longer than outer two; upperparts grizzled brown; underparts grayish white or buff. External measurements average: total length, 270 mm; tail, 110 mm; hind foot, 31 mm. Weight, 80-150 g.
Normally this rat inhabits tall-grass areas where such grasses as bluestem (Andropogon), cordgrass (Spartina), or sedges (Carex) offer both freedom of movement under a protective canopy and an adequate food supply. In such situations, their runways form a network of interconnecting travelways about 5-8 cm wide. 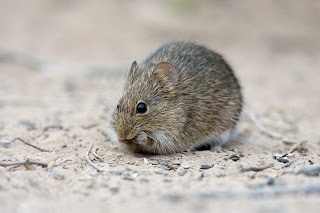 In western Texas, where grassy ground cover is not available, the rats live in dens at the bases of small, low clumps of mesquite in otherwise nearly barren terrain, much after the fashion of white-throated wood rats. Between these two extremes are several types of habitat that may support small populations of cotton rats. Preferred sites are old fields, natural prairie, unmolested rights-of-way for roads and railroads, and other places not subject to flooding and where the vegetation grows rank and tall. The rats place their nests either in chambers off underground burrows or above ground in dense clumps of grass, piles of brush, or other situations that offer some concealment and protection. The nests are globular, about 12 cm in diameter and composed of shredded grasses and weeds. Underground burrows are from 3-5 cm in diameter, simple in design, and seldom longer than 8 m. Occasionally, the rats take over and use the discarded burrows of pocket gophers and moles. Their food is almost exclusively plant material, but there is some evidence that they feed also on the eggs of ground-nesting birds such as bobwhite and meadow lark. The telltale piles of grasses, sedges, and herbs cut into lengths of 5-8 cm and piled at their feeding stations along the runways give a good clue to their natural foods. In captivity, they are fond of most greens, rolled oats, corn, apples, potatoes, dog biscuits, and so forth. 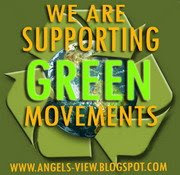 They are active the year round and do not store food for winter use. Cotton rats are prolific and produce several litters of two to 10 young, averaging about five, a year. Captive females have given birth to as many as nine litters a year; data from wild-caught rats likewise indicate a nearly yearlong breeding season at least in the warmer parts of their range. 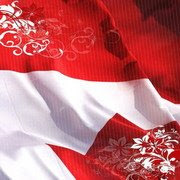 The gestation period is approximately 27 days. Females frequently breed again immediately after partus. At birth the young are hairless, for the most part, pink, blind, and weigh about 5 g. They develop rapidly. The eyes open in about 36 hours, the incisors erupt on the fifth or sixth day, and the young rats are usually weaned when 15 or 20 days old. They can be successfully weaned, however, as soon as the teeth have erupted (5-6 days). 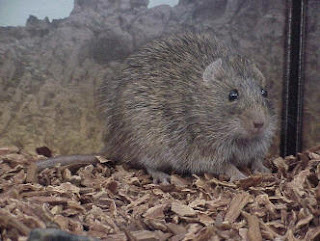 Sexual maturity is reached in about 40 days when the animals are still in juvenile pelage; 6-month-old rats are indistinguishable externally from adults. Cotton rats are subject to violent fluctuations in numbers. The last serious outbreak in Texas occurred in 1958 when millions of these rodents seemed to appear from nowhere and caused serious losses to farm crops, particularly peas, peanuts, watermelons, and cauliflower — as much as 90% loss in some instances. 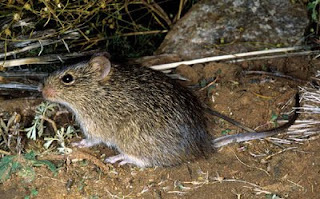 Normally, cotton rats occur in moderate to low populations in all parts of the state where ground cover is present. The size of the population is correlated with the amount of suitable habitat, and suitable habitat in turn is correlated with the amount of rainfall. Thus, in the marginal parts of its range this rat is attuned to climatic changes and the population is subject to violent fluctuations. In fact, peak populations are recorded about every 10 years in central Texas. Records reveal a severe outbreak in 1919. Lesser peaks were reported in the late 1930s and again in the late 1940s. During the 7-year drought that began about 1950, cotton rat populations in central Texas were low because there were few places where they could live in numbers. Ground cover was sparse or even absent over most of their range west of a line drawn from Fort Worth to San Antonio and Corpus Christi. When the rains came in 1957 they were a blessing, not only to the ranchers, but also to the cotton rat. Ground cover increased, providing better cover and more nutritious green food, and the cotton rat population took off. More of the youngsters in each litter could survive and produce young of their own. Because green food was available in quantity during most of 1957 and well into 1958, females were able to produce more and larger litters than normally. By late May 1958, they were found in unbelievable numbers in especially favorable areas. Estimates were as high as several hundred rats per hectare. This rate of increase sounds fantastic, but is not difficult to comprehend when one is aware of the reproductive potential of these rats. Let’s repeat some data for emphasis. An adult female may breed throughout the year in Texas when conditions are favorable. She may produce as many as nine litters of 10 young each (normally less). The gestation period is only 4 weeks, and the female breeds again within a few hours after giving birth. Young females are sexually mature in 40 days and can be mothers at the tender age of 68 days and grandmothers at 136 days! Thus, if we assume a new generation of cotton rats every 68 days, a female could be a great-great-great-grandmother at the age of 1 year and be the ancestor of about 15,500 cotton rats. If this same rate of reproduction were extended for only three more generations and all survived, the grand total of offspring from the original female would be more than 3½ million! Although this potential is always present in cotton rats, it is seldom realized because of death due to predators, disease, lack of suitable or sufficient food, accidents, smaller litters, fewer litters a year, and so on. But when conditions are just right, the population "explodes," and we are hip deep in cotton rats before we know it. Fortunately, every eruption is followed by a crash in the population that is brought on by a combination of factors, principally disease. Predators such as coyotes, bobcats, hawks, owls, and certain snakes take their toll, but the main killer is disease. As the rats increase in numbers, the animals become more and more crowded and provide more contacts for the rapid spread of disease. At the same time, the virulence of the disease increases until finally the crash occurs and the population is low once again.